Many San Franciscans only know the stately Marines’ Memorial Club for its historic bar and 500-seat theater. In fact, the dignified brick building also houses a 138-room military hotel dedicated to the marines, from the historic photos lining the walls to the ship bell from the WWII-era USS San Francisco in the lobby. 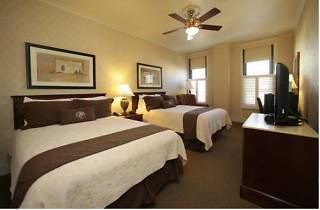 The rooms are comfortable and understated, with leather headboards and subtle red, white, and blue decorative accents. 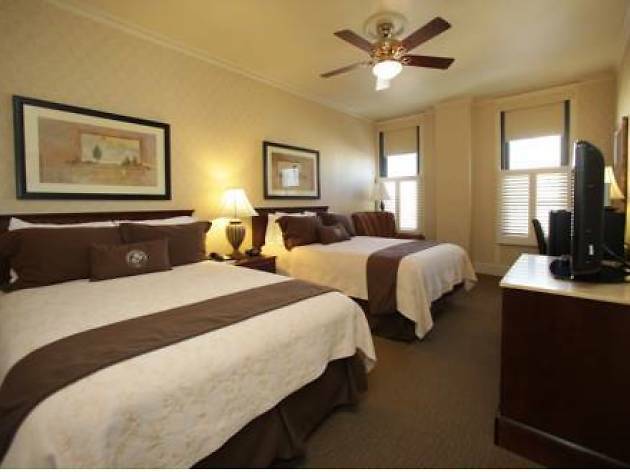 All include free WiFi, flat-screen TVs, refrigerators, robes, and a daily complimentary newspaper. Don’t miss the rooftop restaurant, Leatherneck Steakhouse, where you’ll run into a smattering of friendly veterans at happy hour and dinner is paired with live piano music. A martini or two—and the 12th floor view—will leave you feeling downright patriotic.